On Tuesday three of us took a brief tour of bike facilities along the south side of Route 50 from Providence District Park just inside the Beltway to Fort Meyer where Route 50 makes a sharp turn north in Arlington. The Route 50 corridor is a major commuter route. The road is located in the center of the county and leads from the suburbs into the city. What would it take to create a first class bike facility along Route 50 along the lines of the recently created "cycle superhighways" in Copenhagen? 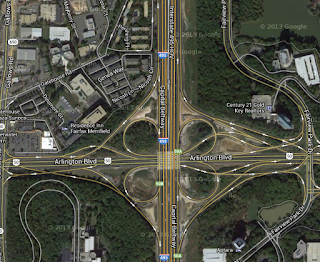 The Beltway/Route 50 interchange is a major barrier for bicycle travel in Fairfax. At the interchange Route 50 contains 4 lanes in each direction with high speed exit and entrance ramps to the Beltway. The speed limit is 45 mph which most motorists exceed; it's very similar to an interstate highway interchange. Few cyclists dare ride through the interchange. Just east of this intersection is the massively over-built Fairview Park interchange that also contains high speed exit/entrance ramps. With relatively high density development on each side of the Beltway, there's a pressing need for pedestrian and bicycle accommodations connecting the two areas. The Lee Highway and Gallows Road Beltway crossings to the north and south now have bike facilities, but they are both located nearly 3/4 of a mile away. We left the rec center and entered Route 50 at Jaguar Dr adjacent to Falls Church High School. We followed a narrow sidewalk along 50 to reach the first segment of service road to the east. Service roads are the best option for traveling by bike along Route 50 in this area. Bike conditions on the service roads are good, with low volume, low speed traffic. The biggest danger is motorists entering the service drive from Route 50. We continued on the service road to the Graham Road intersection, which in the past has been one of the most dangerous locations for pedestrians in the county. bad news for bicyclists. The same thing happened in Tysons on Route 7 and bike conditions there are worse now than before the recent road construction. The other side of the intersection was also under construction. You can see from the second photo that orange cones and barrels are blocking the curb ramp and there are no accommodations for pedestrians or bicyclists. We continued east toward Seven Corners on the service road. The service road turns into a ramp leading uphill toward Route 7, then back down toward Route 50. Just before Route 7 we jogged over to Castle Road, crossed Route 7 and rode through the new transit center near the pedestrian bridge over Route 50. On Castle Road we discovered one of the rare Fairfax County Bike Route signs. The service road continues beyond Seven Corners although it becomes one-way in a couple of places where a contra-flow bike lane is needed. The service road disappears where Route 50 crosses the W&OD and Four Mile Run trails. It then continues beyond the Four Mile Run bridge until just before Glebe Road. At Glebe Road we encountered one of the worst sections of the route, a narrow stretch of unmaintained sidewalk immediately adjacent to the Glebe Rd exit ramp. Another cyclist was riding in the opposite direction so we bailed out to let him pass. This section needs to be fixed soon. The sidewalk should be expanded into a paved trail, with better separation from adjacent traffic. We followed the paved trail just east of Glebe Rd and continued to our turnaround point at S. Washington Blvd and Arlington National Cemetery. The long term vision is to have a first class bicycle facility along Route 50 from Arlington Cemetery to Loudoun County. VDOT conducted a study of bike facilities in Northern Virginia in 2003, the Northern Virginia Regional Bikeway and Trail Network Study. Included were recommendations for improving bike access along two sections of Route 50/Arlington Blvd; from Fairfax City to Arlington County, and a short stretch from Park Drive to Glebe Road in Arlington. According to the NoVa Bikeway study, "Arlington Boulevard is recommended as a key regional commuter route. As such, bicycle facilities along Arlington Boulevard should provide a high quality, direct, and safe connection for bicycle users – in effect, serving as a principal arterial for bicycle travel. As such, improvements along this corridor should provide a coherent and clear path of travel for bicyclists, using a combination of trails, pathways, and service roads." The NoVa Bikeway study does not go into detail regarding needed improvements. Instead it suggests that a new study be undertaken to determine specific recommendations. We hope to work with our colleagues in Arlington County to begin to address the need for better bike facilities along Route 50 by advocating that VDOT conduct a detailed study of the corridor to determine the best solution for bike access. Is it possible to create a cycling superhighway parallel to Route 50? How much would it cost? We'd like to know. this would be fantastic! every time I pass that pedestrian bridge in Seven Corners I dream about having one crossing the Beltway next to hwy 50. also need one on Little River Turnpike across the Beltway to link to NOVA community college. I've been leading the BTWD commuter convoy from Providence Rec Center for the past four years. Getting to Providence from the W&OD and leading inexperienced riders down route 50 to cherry is one of my least favorite experiences. I would love to see another viable route in to Arlington and DC but this is definitely not it now. It would be hard to build a bikeway through the Beltway/Route 50/Gallows interchange itself without a full rebuild of the interchange. And, to be honest, 50 west of the Beltway isn't very bike-friendly in the stretch between Gallows and Fairfax Circle. Maybe a ped/bike crossing could be built between Gatehouse Rd. and Fairview Park a little further north -- too bad that couldn't have been arranged as part of the 495 Express construction.